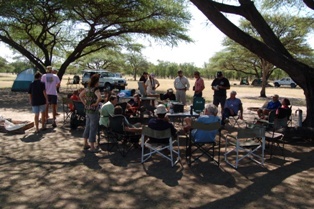 36 people attended the 2010 Namibian ringers' get-together (RGT) at Kakuse farm near Tsumeb. The first RGT was held at Wiese farm in 2004. Nearly 300 birds were ringed with Blue Waxbills and Red-billed Quelea being the most often caught species. Not all ringers came to ring birds, however; some attended simply to enjoy the wonderful social atmosphere at these get-togethers. Read more about this event here. Weavers that have been ringed here previously are White-browed Sparrow-weaver, Southern Masked Weaver and Red-billed Quelea. Red-billed Buffalo Weavers breed here. Chestnut Weavers have visited but were not seen on this visit.